I got a Classicflix in the mail! What is Classicflix? Well, it’s kind of like Netflix only all the movies and TV shows they carry are from before 1970 (I find it useful for watching old monster movies and classic comedy team flicks). 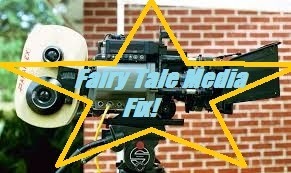 When I started this blog, I made it a point to go onto Classicflix and put some older, non-Disney fairy tale movies on my queue. Now, the first one has arrived. So, what fantastic actors from the Golden Age of Hollywood are here to depict the tales and lore of yesteryear . . . Okay, so maybe not what everyone was expecting. I actually have a better picture around here somewhere that I used for a different post. Where is it? Ah, here we go . . .
And I wear it proudly! Now, you may think that as such a big fan that I wouldn’t be happy with a couple of clowns like Abbott and Costello adapting it. 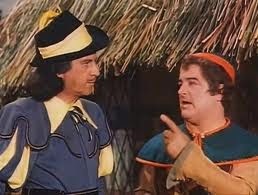 But I’m actually a big fan of Abbott and Costello too. I’ve liked those guys ever since I saw them meet Frankenstein. So, let’s see how the boys do with their fairy tale adaptation. Now, the plot starts out in a sepia toned “real world” setting. Here, we’re introduced to the players. 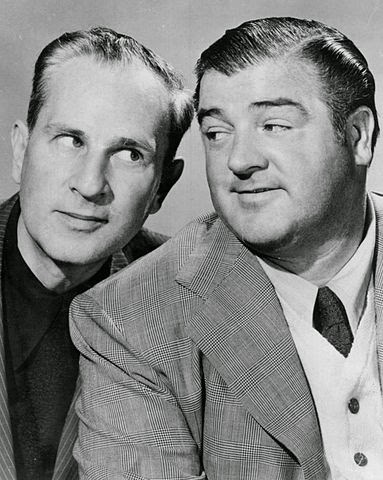 Jack (Lou Costello) and Mr. Dinkle (Bud Abbott) are looking for work at an employment agency. Jack makes a pass at the woman at the desk (Dorothy Ford) only to run afoul of her boyfriend, a very tall police officer (Buddy Baer). The duo get assigned to a babysitting job looking after an intelligent but problematic child named Donald so that his big sister (Shaye Cogan) and her fiancée (James Alexander) can go out for the night. Upon arriving, Jack attempts to read Donald the story of “Jack and the Beanstalk” (which our hero refers to as his “favorite novel”) only stumbles over the big words. So, he gets Donald to read it to him instead. Jack starts to fall asleep and dream the story of “Jack and the Beanstalk”. So, they’ve already turned the Hollywood cliché of the kid dreaming the story he’s being told on its ear b having the kid read the story to a dreaming adult. The giant is only twice as tall as his wife, who looks to be an average size human. Yet, in some versions of the story, regular people are practically the size of bugs by comparison. Getting back to the movie itself, it’s really not a bad little film. There are some songs, as many family films of the time had. They’re not fantastic, but they’re not bad either. As for Costello’s performance as Jack, he doesn’t come across as a typical hero. However, that’s what makes it work. 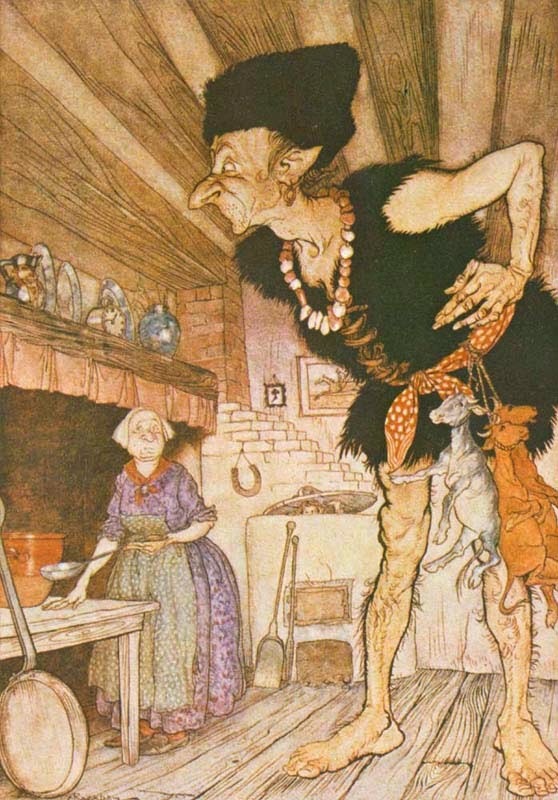 While “Jack and the Beanstalk” is a fairy tale, traditional English “Jack Tales” are often fool stories about a foolish boy whose actions defy traditional logic yet comes out okay in the end. I have to say, other than maybe the version from Into the Woods, there are few versions that capture the essence of “Jack as fool” quite as well as Costello’s version. It’s not to his detriment, either. While he may be a fool most of the time, he also proves himself uncommonly brave and resourceful at other times. It’s just what you’d want in a Jack. On Internet Lists and Ruined Childhoods. Folk Tale Secret Stash: The Golden Twig.